Inflatable hot tubs are becoming a trend today. For some reason, homeowners are really loving the idea of having a portable spa inside their respective homes. And who doesn’t, right? But even so, buying an inflatable hot tub for two can be really challenging, especially if this is your first time to look. Aside from the wide variety of selection in the market, there are also several factors that you may need to consider first. 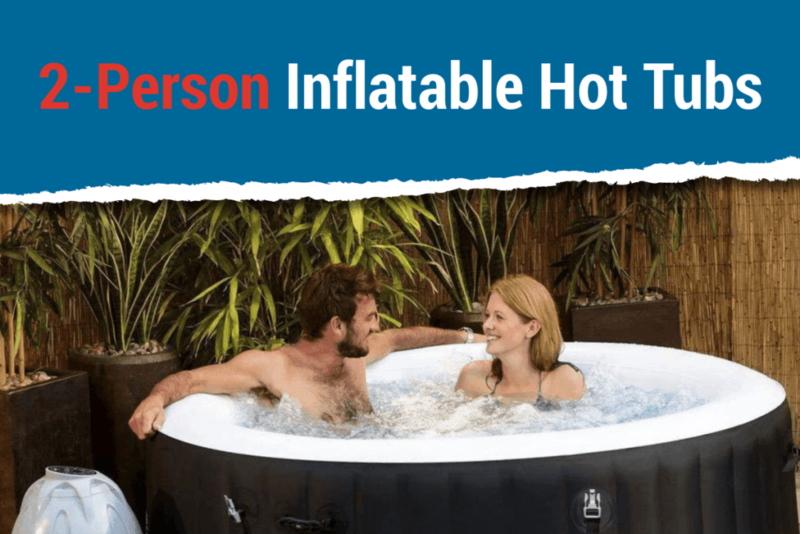 Accordingly, this guide to 2 person inflatable hot tub deals of today might help you in your search! In this guide, I have included 8 of the very best inflatable hot tubs that may suffice your needs and wants. And if this is your first time to search for a 2 person spa, you will certainly be excited! This inflatable hot spa from ALEKO is one of today’s minimalistic types. And if you are a fan of black and white colors, this might be a perfect match for you! ALEKO Oval Inflatable Hot Tub is portable and compact. The setup and installation processes would only take a few minutes. Also, it would only require a total of 3 hours for heating water. Hence, you could use this as soon as possible. If you are looking for a great bath, this one won't disappoint. The dimension of this 2 person hot tub is rated at 75 x 47 x 26 inches. It is quite spacious for 2 persons if you disregard the inner dimension. However, the inner dimension is rated at 59 x 32 x 26 inches. The walls are quite thick. So, it may not be too roomy for 2. 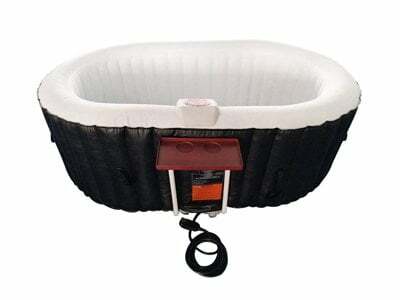 If you are looking for a simple inflatable bathtub where you can rest and relax while you take a bath, the Inflatable Bathtub Folding Inflatable Pool quite fits the requirement. Apparently, this inflatable bathtub is perfect for kids. But even so, adults can also utilize this since it can accommodate even people who are 6-foot tall. 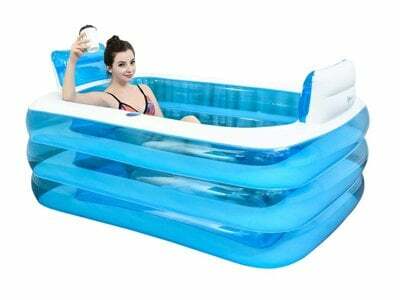 Other than its capacity to accommodate 1 to 2 persons and 58 gallons of water, there are no other special features in this inflatable bathtub. It does not have any bubble-massage or hot water function. Although you can fill it warm water, you still need to be careful since the material of the construction is not entirely designed to take in hot water. 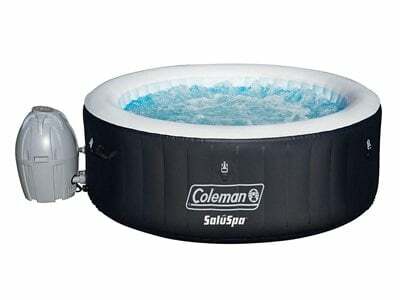 The Coleman Portable Inflatable Hot Tub is one of the most popular inflatables of today. Aside from its prominent brand, it is considered to be the go-to 2 person blow up hot tub in 2018. This 2-person inflatable hot tub portable spa can actually accommodate up to 4 persons which makes it really ideal and roomy for 2 persons. There are no specific jets used in this hot tub. But, it uses a high-power bubbler which is quite effective for massages. The maximum temperature that it can reach is up to 104 degrees Fahrenheit or more. However, it takes too much time for heating up and it largely varies depending on the temperature of your surroundings. Also, it is not advisable to turn on the heater when the room temperature is rated at 40 degrees Fahrenheit. Are you looking for an all-around two-person inflatable hot tub? If you are, then the SaluSpa Miami AirJet 2 Person-Inflatable Hot Tub might be the one for you! The dimension of the SaluSpa Miami AirJet is quite promising as it can actually accommodate up to 3 to 4 persons. But, this is much more ideal for 2 to 3 persons considering the thickness of the inner dimension. And this is also why it has only 177 gallons of volume capacity. The thing that quite amazes me is the fact that this inflatable hot tub for two is really all-inclusive. You don’t need to worry about the maintenance. Also, it comes with a smart digital control panel wherein you could adjust the temperature, filter cartridges, and a chemical floater. However, heating the water may consume too much of your time. 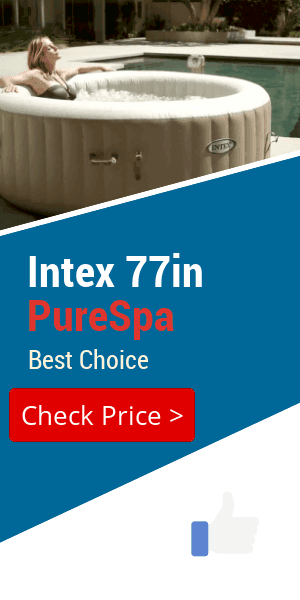 If appearance and style play an important role in your buying decisions, then you might want to consider the Intex-PureSpa Bubble Massage Spa Set. This Intex 2 person hot tub comes in a very sleek and classy appearance. But aside from its appearance, its built-in features are largely the reasons why many consumers choose this as their first portable and inflatable hot tub. It has a built-in hard water treatment, 120 high-power bubble-jets, two easy-to-replace filter cartridges, an inflation hose, and a carry bag. 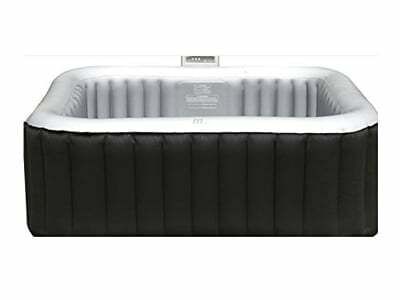 The Goplus Outdoor Spa Inflatable Hot Tub for Portable Jets Bubble Massage provides a much cheaper cost and much small dimension ratings. But while the dimension rating is much smaller, this inflatable hot tub is still ideal for 2 persons. 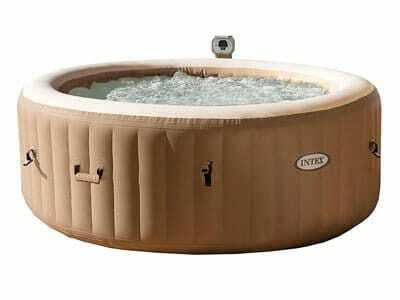 In fact, this 2 person-inflatable hot tub can even accommodate up to 3 to 4 persons. Also, you no longer need to worry about any hard water concerns because along with the filtration system, it has a built-in hard water treatment system. The M-SPA Lite Alpine Square Relaxation and Hydrotherapy Outdoor Spa is the most unique among all in this list. And this might be the perfect 2-person hot tub for you! 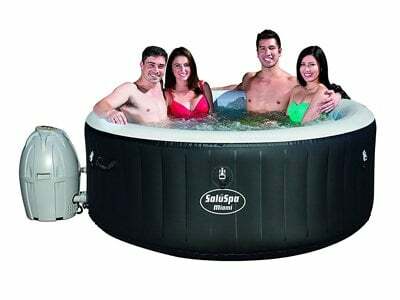 The shape of this inflatable hot tub is square which is quite unique since most of the average types are in a circle or oval shapes. But while the dimension rating is quite smaller than the usual, it still can accommodate 2 to 4 persons. There is nothing really special in this two person-inflatable spa except for its 108 air jets that comes with a quiet whisper technology. But even so, it’s very silent when you use this feature. The Intex PureSpa Inflatable Spa Heated Hot Tub is similar to the first Intex PureSpa listed in this guide. The only difference is this model is the much-improved version of the predecessor. The thing that makes this model a much-improved version is that it is much more durable and sturdy in comparison to the previous one. Also, the temperature rating of this new model can provide a much higher rate. Hence, you no longer need to wait for 12 to 15 hours just to heat water. But while this is considered to be the “2.0 version” of the previous model, it still comes with the same set of accessories and features. It still has its 120 high-power bubble jets, an effective digital control panel, the built-in hard water treatment system, Suspended-Crystals Technology, two replaceable filters, carry bag for storage, and an inflation hose. The 2 person hot tub deals listed above are all great in terms of quality and functionality. But even so, you will still need to consider a lot of factors first. If this is your first time to buy an inflatable hot tub, some of the primary things that you should consider are the size and dimension of the inflatable hot tub and the space that you intend to use. When you intend to place your chosen inflatable hot tub in a small area, make sure that the dimension of the product will fit accordingly. Hence, you have to consider as well the ease of installation and setup in this aspect. Even so, there is no need for you to worry if you do have a small space or area. This is because there are several 2 person inflatable hot tub deals on the market today that are designed for small spaces. Another factor that you need to consider is the capacity of the tub as well as the total water volume that it can accommodate. Since you are looking for an inflatable hot tub for two persons, you might want to consider the hot tubs that are mainly designed for 3 to 4 persons. This is because these types of inflatables are very ideal for 2 persons. It will be very roomy and spacious for the two of you. Along with the capacity, you need to regard the volume of water that it can accommodate as well. Normally, any 2 to 4 person inflatable hot tub would have a water capacity of 150 up to 250 gallons. This factor is very essential, especially if your buying decisions are inclining towards the heating features of an inflatable hot tub. Usually, this is where it gets tricky for most inflatable hot tub packages of today. Apparently, there are hot tubs today that cannot provide effective and efficient water heaters. These kinds of products tend to be very inconvenient in many aspects. It could cost you more due to the excessive energy consumption. Also, ineffective water heaters are very time-consuming. In fact, there are 2 people inflatable hot tub deals today that would require 24 to 48 hours just to heat water. The maintenance aspect of your chosen inflatable hot tub is an important factor to consider as well. Keep in mind that these hot tubs are similar to any swimming pools. They largely need maintenance as well to retain its original quality and value. 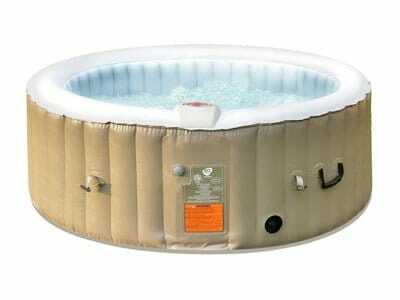 There are inflatable hot tubs today that would already include the things that you will need to maintain the product. You can also go for insulated cover to protect your inflatable spas. And in terms of practicality, I highly suggest that you prefer these types of deals and packages since they would cost much cheaper than buying them separately. In each inflatable spa hot tub, specific jets and bubblers are equipped. And these are largely the responsible ones that provide the massaging effects. Some hot tubs feature the Air Jets which are actually the most common type. And they are pretty inexpensive. As for the other type of jets, these are the Hydro Jets and they are normally equipped with most high-end types of inflatable hot tubs. Apparently, they are expensive because they can provide much wider options for massaging methods. The simplest type of massage jets are the normal bubblers. They function like air jets but they do not largely provide the same massaging effects as what air jets can deliver. 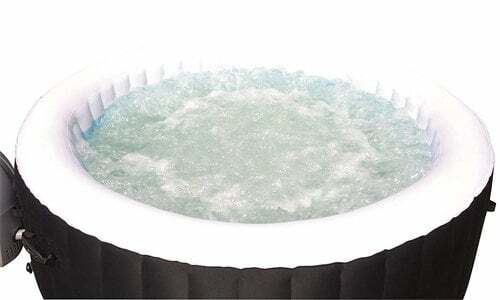 After reading all hot tub reviews, Among all the products given above, the one that stands out the most is the Coleman Portable Inflatable Hot Tub. It’s very affordable and yet fully functional. Also, it is quite complete in terms of its package inclusions and accessories. Plus, it is very ideal for 2 persons. But while it may take time for heating water, there are several workarounds that can be done to resolve this concern. In fact, the company’s customer service can help you with this. In totality, this guide aims to help you in making your buying decisions when it comes to purchasing the most appropriate 2-person inflatable hot tub for you and I hope it did its job.